You won't find conservatives at this den of bigotry! Make America Great Again. Boycott anyone? Hypocrisy alert! U.S. Bishops take note: The paragraph highlighted in red is for you! 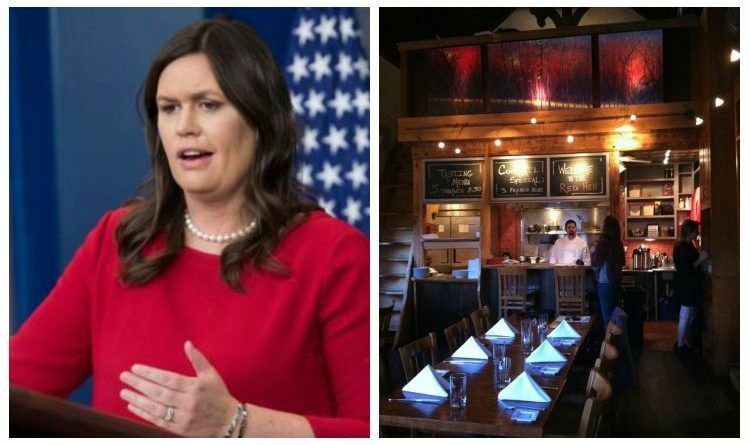 Last week, at the Red Hen restaurant in Lexington VA, Sarah Huckabee Sanders was denied service merely because she supports President Trump in fulfilling his commitment to enforce the immigration laws passed by Congress before he assumed the office of the Presidency. It thus seems that some leftist Democrats in Virginia would like to change the logo for the Commonwealth to read VIRGINIA IS FOR SMUGGLERS, rather than VIRGINIA IS FOR LOVERS. This would help to advertise to those desiring to illegally infiltrate into America that the Commonwealth wants to unconditionally welcome them. With no vetting whatsoever, gang members such as MS-13, rapists, drug smugglers, child molesters and human traffickers are apparently to be allowed to infiltrate into the Old Dominion, and, through her, into the rest of the nation - just as long as such criminals claim to be merely migrants. In addition, some of these leftists are demanding that anyone who insists that such infiltrators submit to our laws by being vetted, much less screened for contagious diseases, should be charged with a hate crime. Ironically, all this puts the radical leftist Democrats in a dilemma. If, as they allege, America is a nation built on racism, oppression and exploitation, why would they want anyone want to migrate here? Likewise, in light of the fact that migration is a way of decisively asserting that the host nation is better than one’s home country, it seems that such leftists should view migration into America as an act of racism. After all, those who take the risks involved in migrating or infiltrating into America seem to be embracing the “racist” premise of American exceptionalism. Note also how the bleeding hearts crying about the processing of those illegally entering our country argue that they need to stay because of the oppressive and unsanitary conditions of their homelands. These are the same people, who took umbrage, when such nations were allegedly referred to by as “s--tholes.” Why then would leftist progressives want to encourage millions of people to flee from their “tropical socialist utopias” into America, which they allege is rooted beyond redemption in racism, discrimination, oppression and exploitation? This also opens up another dilemma for Catholics in America. It is rather ironic that many leaders in the Catholic Church insist that even parents be vetted through the VIRTUS program before being allowed to actively assist in the catechesis of their children on church premises. Likewise, they insist that anyone desiring to spiritually migrate into the Catholic Church must submit to being vetted through sacramental preparation classes, the RCIA process and the Marriage tribunal. Yet many of these same Church leaders are now insisting that our government officials assume that any adult illegally infiltrating our nation with a child should, with no vetting whatsoever, be assumed to be a relative of that child. It thus seems that these Church officials are more than willing not only to turn a blind eye to the possibility of human trafficking of children by migrants, but also to unconditionally provide such human traffickers of children with a certain degree of moral legitimacy under the mantle of “social justice”. It is ironic that current Church protocols thus seem to require that we presume all our parish volunteers to be potential pedophiles until proven otherwise by extensive VIRTUS vetting. At the same time, some very prominent Church leaders are also claiming that we are judgmental and intolerant, if we dare to insist that those illegally infiltrating into nation be vetted before they are entrusted with the care of unaccompanied minors infiltrating into our nation with them. Wolves are not the only predators that can decimate a flock. Coyotes, clothed in the mantle of “social justice”, can do so as well. What a perfect comparison! And great timing, too! It reminded me of how McCarrick probably imposed the farcical VIRTUS program on others...what a sick joke! But that strays from the obvious point that every parish has barriers to entry, which the liberal prelates would never criticize or give up. thanks so much, dear Fr. Tom, for these words full of wisdom.... things as they are continue to spread hate and, unfortunately, our Church instead of helping is adding fuel to the fire. You speak so well for all of us who have no access to expressing our frustration...to feel frustrated with regard to the government is one thing but to be about the Church we love and respect and would like to defend is a totally different thing. Thanks so much! And please, keep on being the voice we need.